Sometimes, you arrive at a darkly disturbing travel site when you least expect it. Standing in the courtyard of Rila Monastery. Image © Anita Isalska. See more on my Flickr page. I had wanted to visit Rila Monastery in Bulgaria for a long time. I saw pictures of its striped columns and enormous domes, a strange and beautiful contrast with the vast Rila Mountains, and wanted to see this dramatic sight for myself. 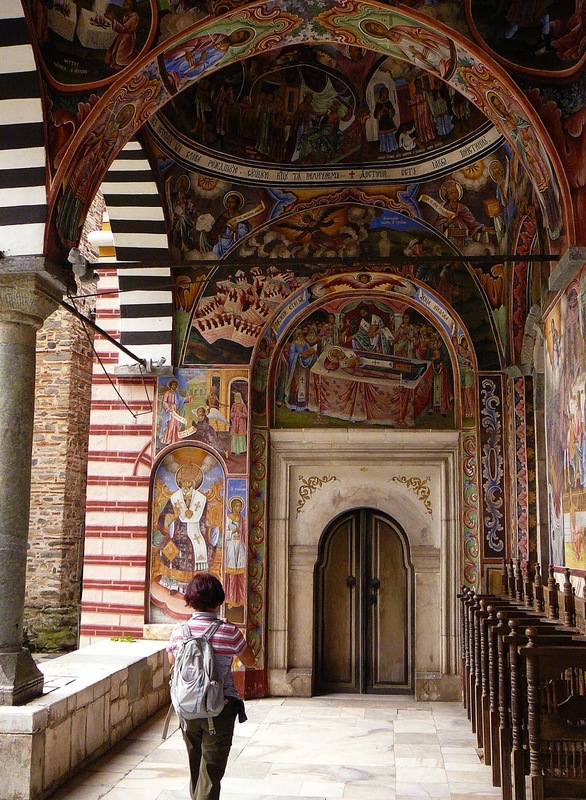 Riotous colours in the archways of Rila Monastery. Image © Anita Isalska. 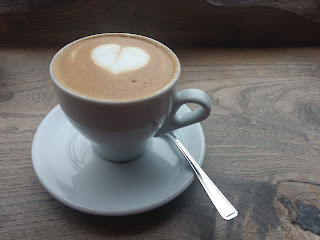 See more on my Flickr page. What I didn't expect was how macabre the artwork at Rila would be. The initial impression of most visitors is to be dazzled by the colours in Rila Monastery. But look closer and you'll see tortured souls adorning the walls, being drowned in lakes of fire, swallowed by dragons, and ushered down to Hell. A gruesome depiction of sinners being dragged to Hell (while long-dead believers awake in their coffins to be summoned to Heaven). Note the livestock with body parts in their mouths. Image © Anita Isalska. See more on my Flickr page. 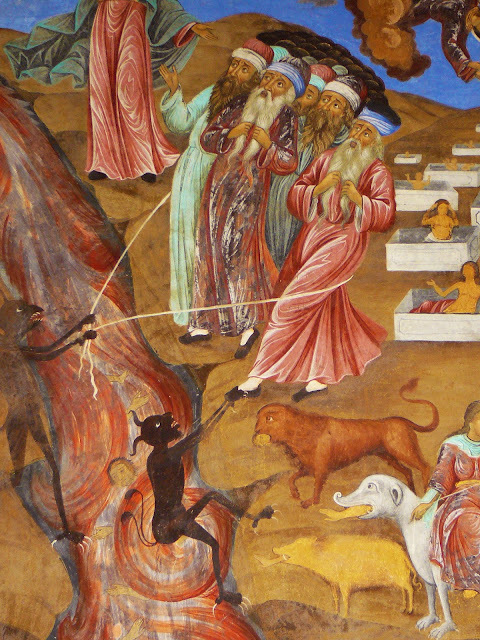 St Ivan of Rila, who founded the monastery in the 10th century, was a recluse in the ascetic tradition. In the solitude of the Rodopi Mountains, Ivan Rilski had plenty of time to ponder the Fall of Man. This unusual ceiling fresco shows King Herod's soldiers butchering babies, per the New Testament story of the Massacre of the Innocents. Image © Anita Isalska. See more on my Flickr page. Faced with isolation, it's hard not to be confronted by the uglier aspects of human nature. But Ivan Rilski is known mostly for his affinity with the natural world, numerous miracles, and taking on a life of cave-dwelling hardship to purify his soul. 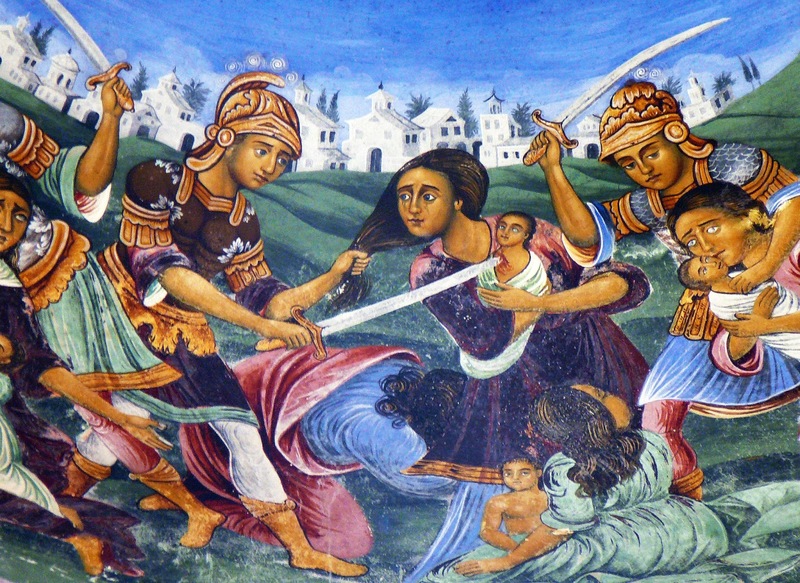 It would be hundreds of years after his death, in 1846, before the monastery's remarkable murals would be completed. What's worse, a river of fire or being gobbled by a monster? Image © Anita Isalska. See more on my Flickr page. 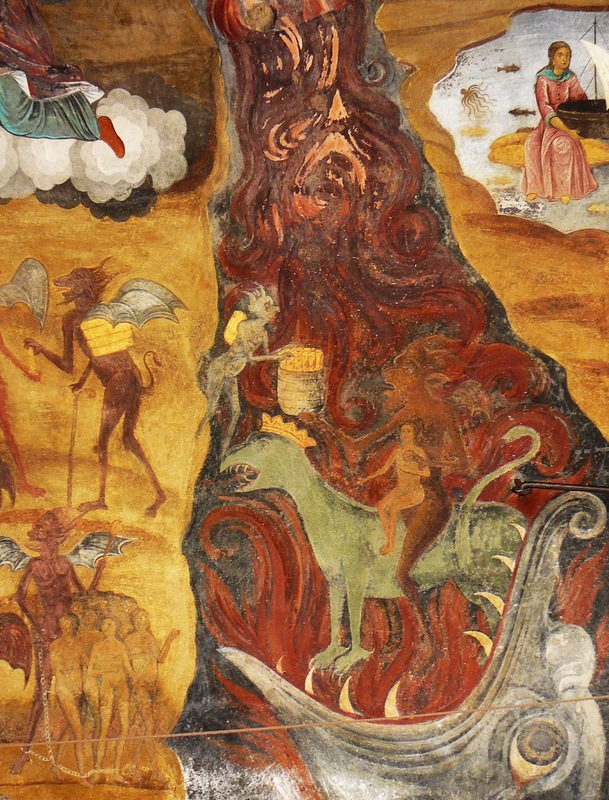 The very best of Bulgaria's painters and architects perfected Rila Monastery, and their inspiration draws heavily from the Bible's most nightmarish content. 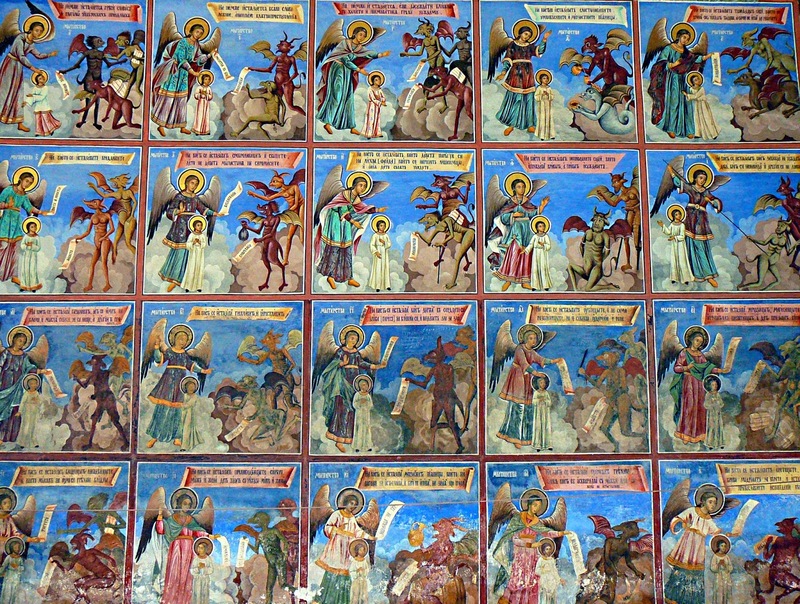 Strolling around the monastery today, you'll chance upon bloody scenes from the New Testament, such as the Massacre of the Innocents, right through to the surreal horror of the Book of Revelation - multi-headed dragons, beasts from the sea and an agonised angel of woe. 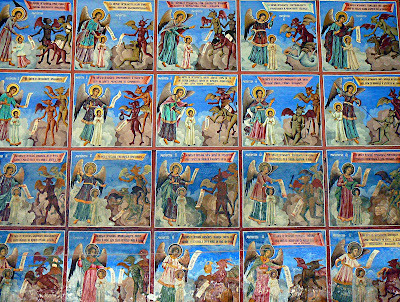 Almost like a comic strip - another of Rila's murals. Image © Anita Isalska. 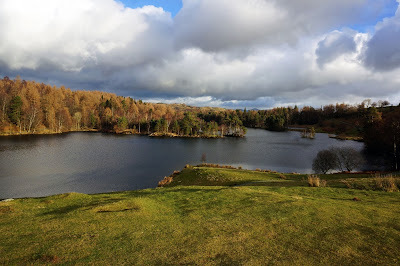 See more on my Flickr page. This remote monastery is a place of peace and retreat, but it is also an unflinching insight into believers' terror of the final judgement. Find it: there are buses to Rila village from Sofia, Blagoevgrad and Dupnitsa. Alternatively, Sofia is full of tour operators willing to take you on a day-trip. 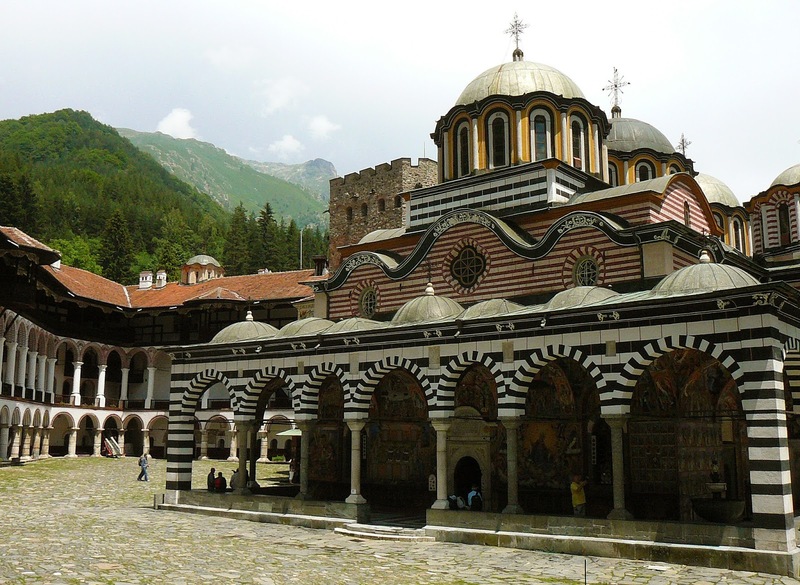 Rila Monastery Shuttle will throw in an excursion to Sofia's Boyana Church.